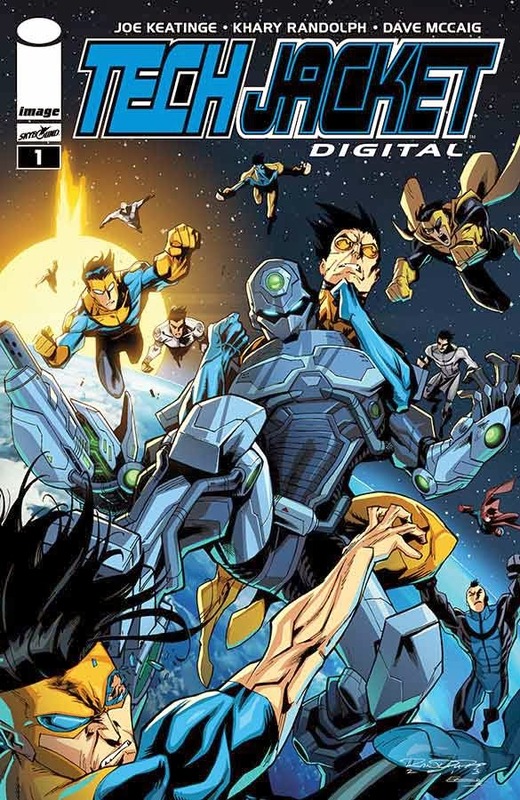 The fan-favorite series TECH JACKET, returns with an all-new three-issue digital miniseries. Written by Joe Keatinge (GLORY, HELL YEAH) and drawn by Khary Randolph (Spider-Man, Hellboy), this miniseries is the perfect introduction to Kirkman and EJ Su's exciting superhero. The return of TECH JACKET picks up a bit later than the original run. “The original Tech Jacket run was largely about Zach having his role as our planet’s Galactic Guardian thrust upon him, fumbling with this new title, unsure of anything he encountered,” said Keatinge. “Here Zach’s firmly in his position—perhaps even getting a little too comfortable with it—and finding out that being Earth’s defender from what lies beyond is more dangerous than he could ever imagine." Ravaged by the Invincible War, Zach Thompson needs some time away from being Earth's galactic guardian. But when his vacation doesn't go as planned, Tech Jacket must return to face a brand new threat. TECH JACKET, issues 1-3, will all be available exclusively for one week on www.imagecomics.com, before going live across all digital platforms. All three issues will be available simultaneously in 2014.